Getting rid of weeds and clearing overgrown patches of grass, growing in places a rotary mower just can’t access can be a tough job, and you need an equally tough tool to handle it, lightweight, balanced tool with a strong line for trimming up close to obstacles without damage, able to edge lawns but also with a robust and sharp blade attachment for heavy duty weeds and really rough grass. 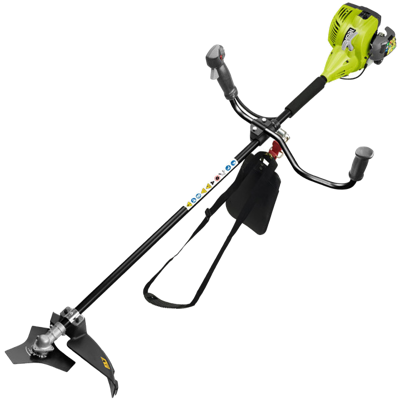 In fact you need a tool like the Ryobi Petrol RBC26SB Trimmer/ Brushcutter. With both a nylon line for trimming and strimming and a swappable three-pronged ‘tri-arc’ metal blade for heavy duty clearance of undergrowth including nettles, brambles and thick grass, the Ryobi RBC26SB 26cc two-stroke brush cutter is just the tool you are looking for, lightweight, powerful, ergonomic and packed with attractive and functional features. The Ryobi Petrol RBC26SB Brushcutter has a broad and practical working width of 46 centimetres and many specially designed features including the patented ‘StartEasy’ carburettor, which guarantees an easy start every time with the recoil pull action, and a very advanced 26cc petrol engine delivering maximum power with minimum emissions. Two-stroke machines have good torque and are easy to use and maintain. They have few parts to go wrong and have a good power to weight ratio, so are ideal for hand-held tools like this brushcutter. Ergonomic design means a well-balanced action with good weight distribution and the handle benefits from soft-grip comfort padding to reduce vibrations and make the job comfortable. Transport is easy, as is storage, and there is a ‘Reel-Easy’ cutting head and the ’Thread and Load’ rapid line feed system for the 2.5mm nylon line. This model comes with two-stroke oil, a quality quick release shoulder strap for comfort and a wrench and is compatible with the Ryobi Expand-it range of add on accessories.